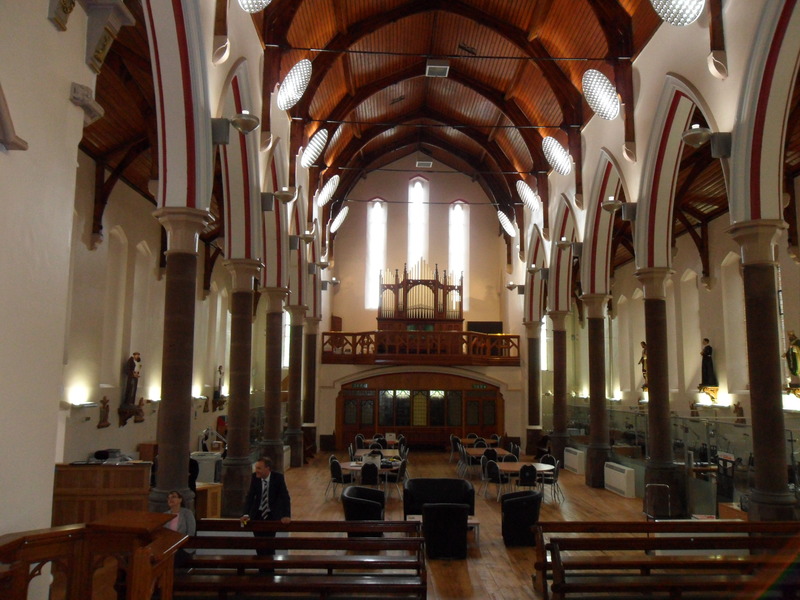 Week 35 marked the conclusion of the redevelopment work of St Marie’s, so for one last time, let’s enjoy the photography of Dave Clark, our superb Project Manager from John Turner Construction Ltd. Thanks Dave! The photos were taken on Friday 27th June. 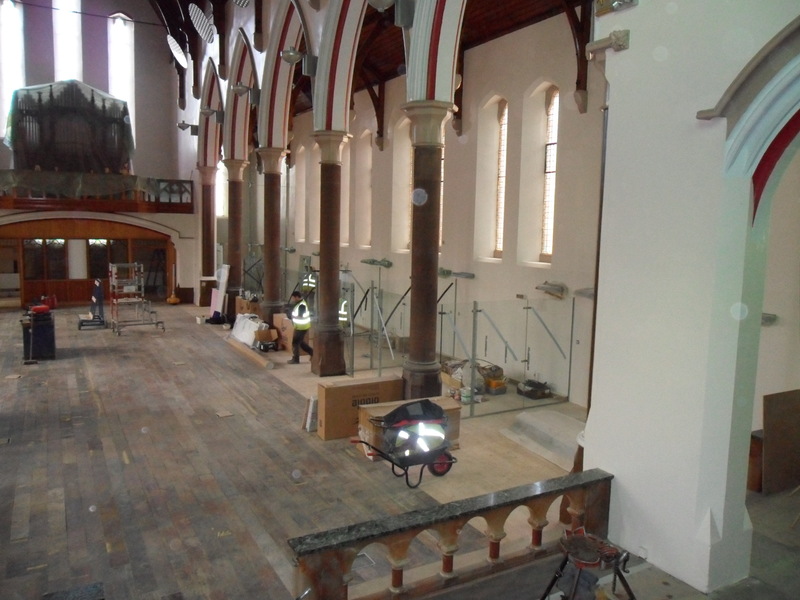 There’s still a lot of work to be done inside St Marie’s; getting the IT, phone lines etc up and running for Halton & St Helens VCA, as well starting on the heritage displays, but the building itself is pretty much completed. The path between St Marie’s and Lugsdale Road is nice and tidy. 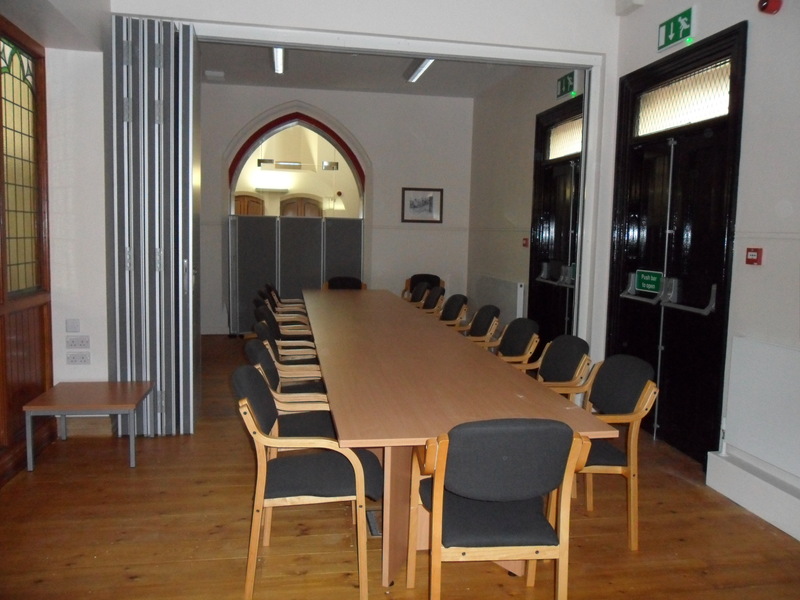 The area below the Organ Loft is now a Board Room for Halton & St Helens VCA. 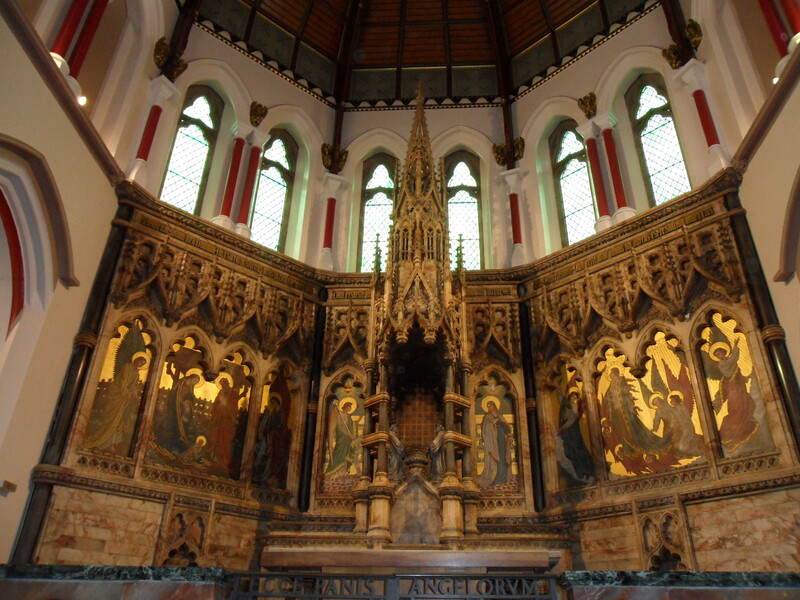 The paintings on the Altar have been varnished and are now fully restored. Looking down the room from the Altar. “Hello” to Dave from Healthwatch Halton. 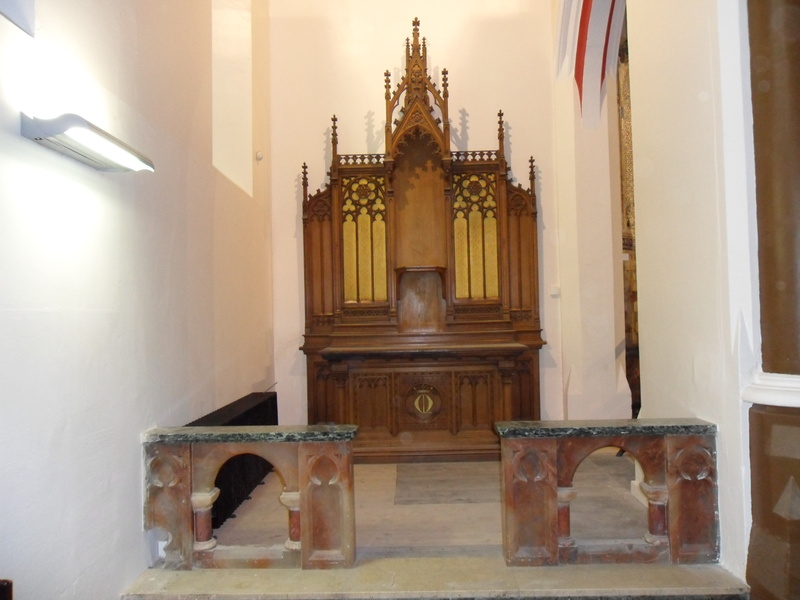 The gates to the Altar have been returned and refitted. The following photos were taken on Friday 20th June. 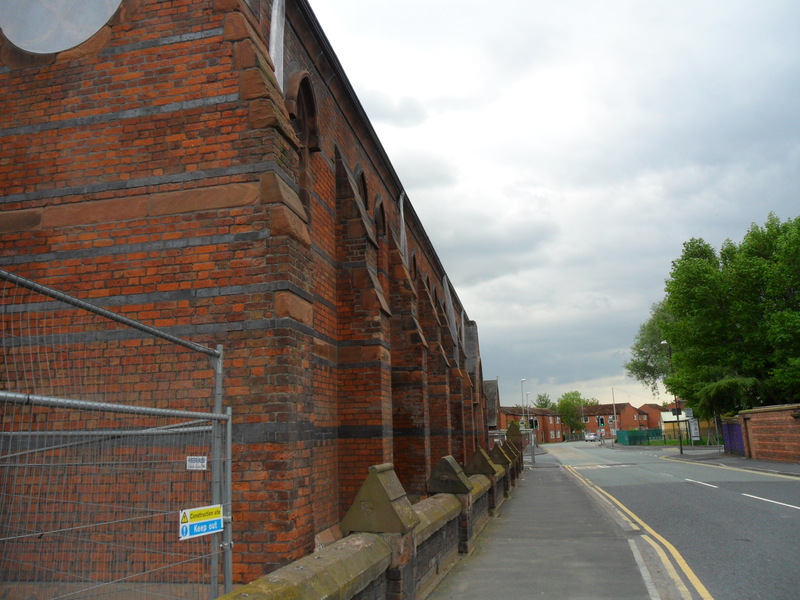 As you can see, we’re in the final throws of the redevelopment and progress seems to be at quite a pace! 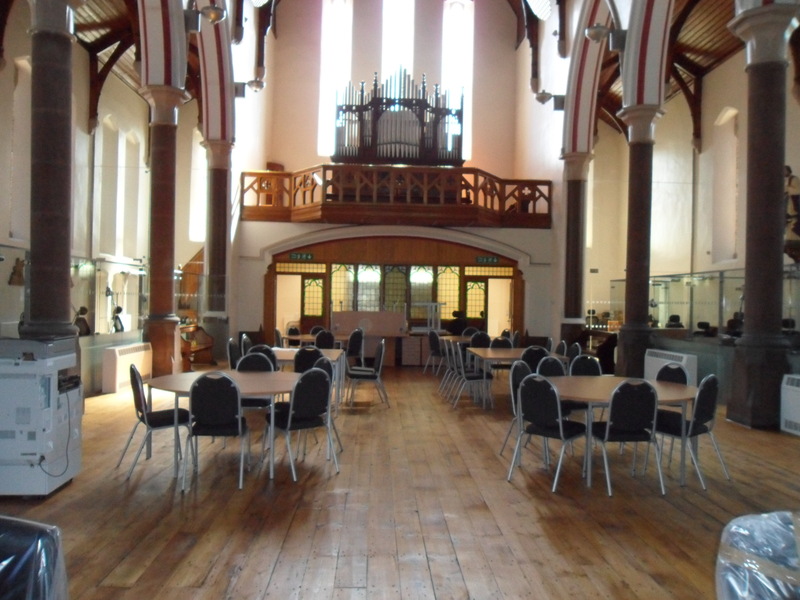 The photos were taken by Dave Clark from John Turner Construction Ltd.
A view of the centre of the room (available for meetings, consultation exercise etc). 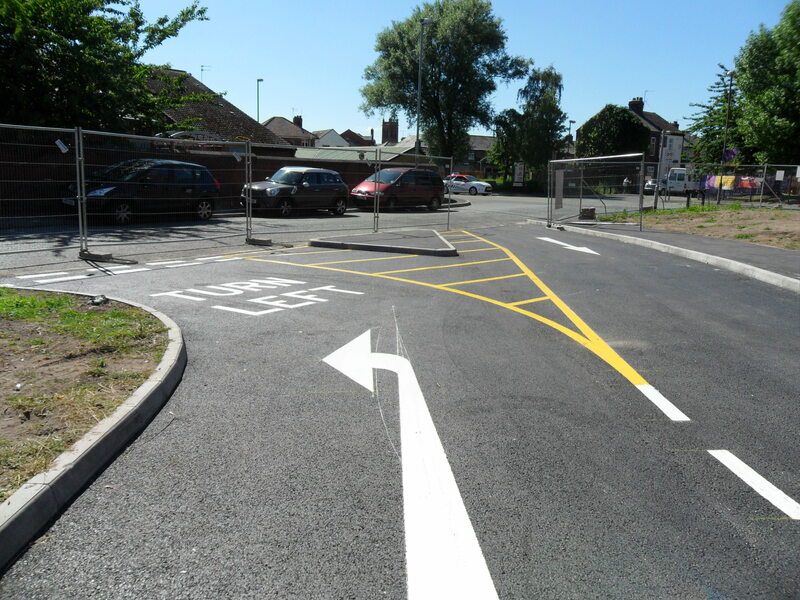 Road markings to make sure that visitors know they’re in a wee one way system. 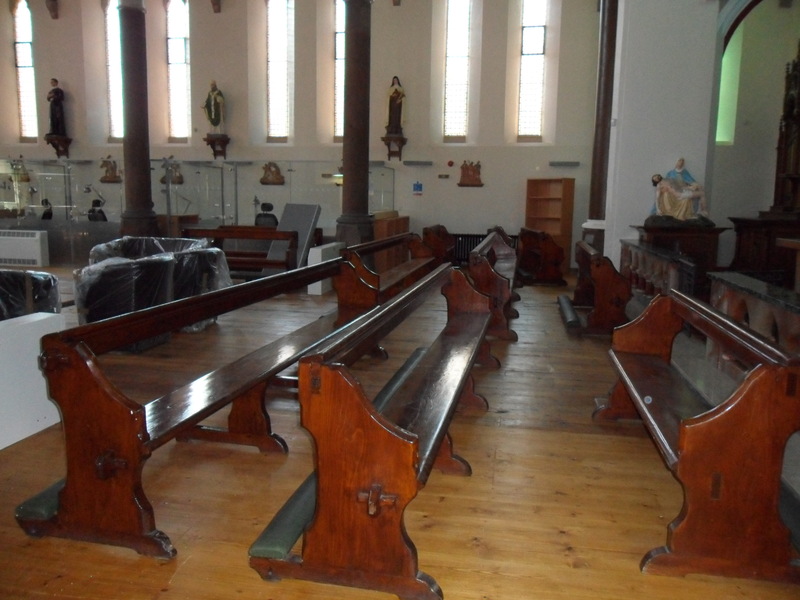 The statues are back inside St Marie’s. 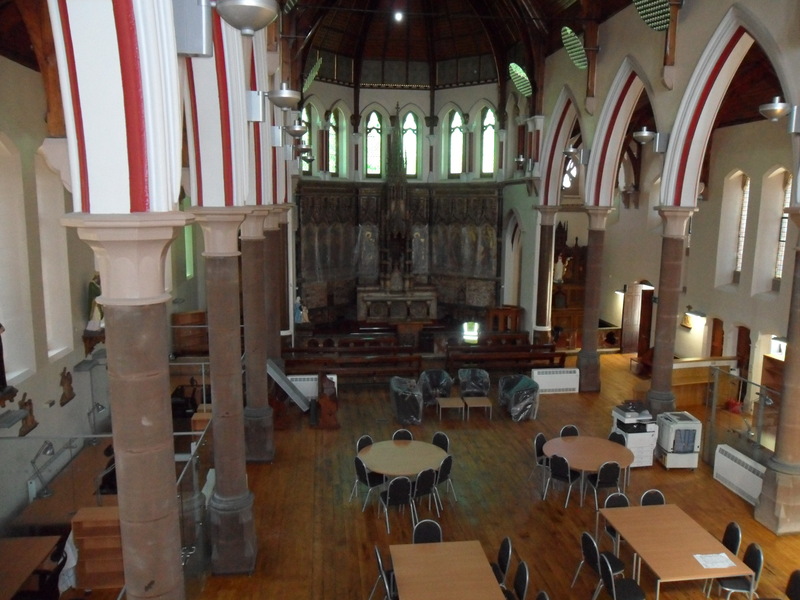 This view (from the Organ Loft) also shows the offices on the left hand side of the building. 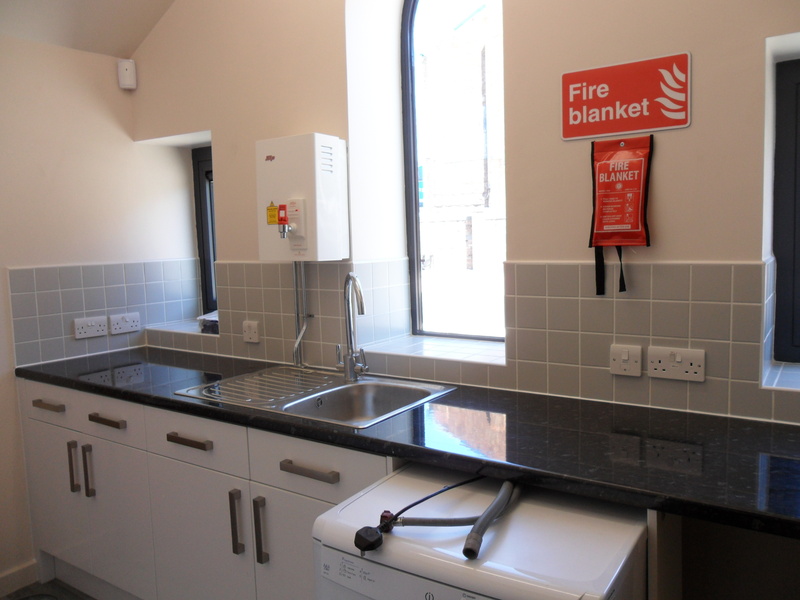 The kitchen (now finished) was once one of the confessionals. There was so much going on in Week 34 that I decided to break it up into two separate posts. 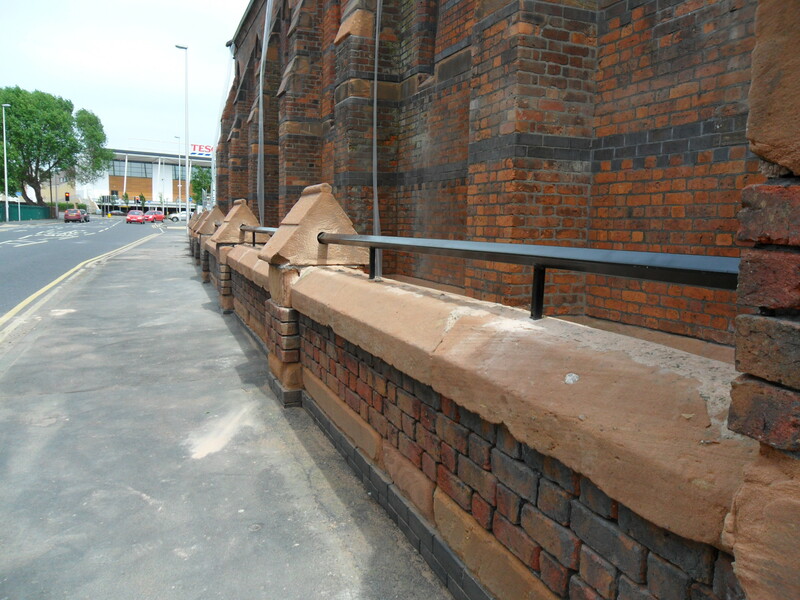 The photographs below were provided by Dave Clark from John Turner Construction Ltd. The following photographs were taken between Monday 16th June and Wednesday 18th June. 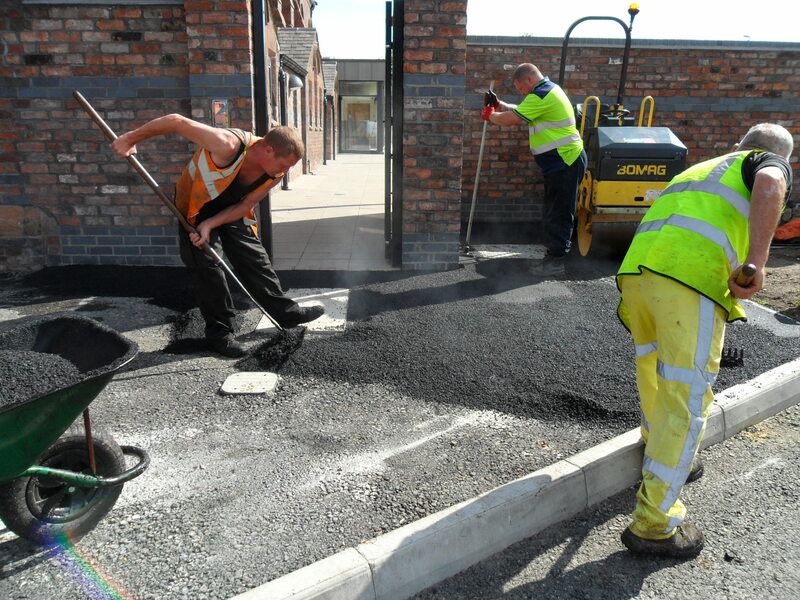 The lads lay a nice, new tarmac path. 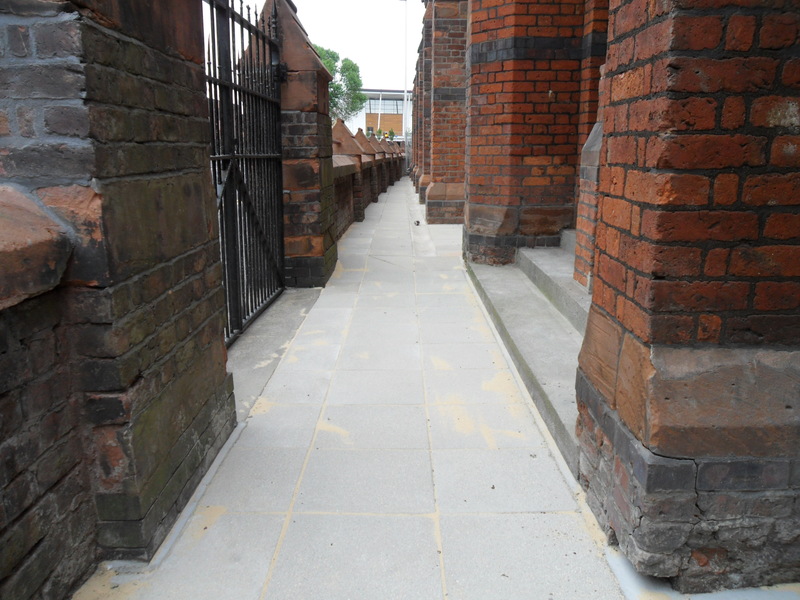 A ramp is installed outside the extension to improve access for people with disabilities. 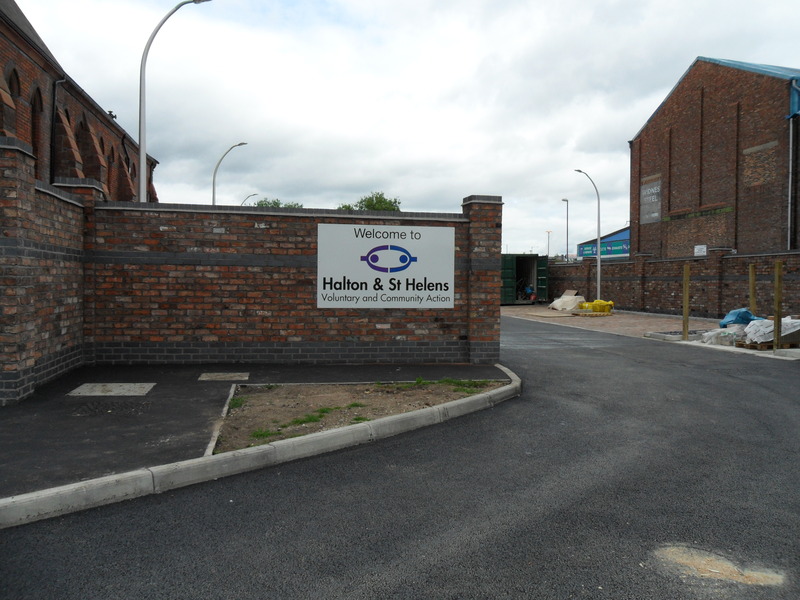 The sign for Halton & St Helens VCA goes up! The covers have come off the organ and it’s been polished up nicely. Note the difference in the floor since previous photos. An interesting view of the offices down the wings of the building. 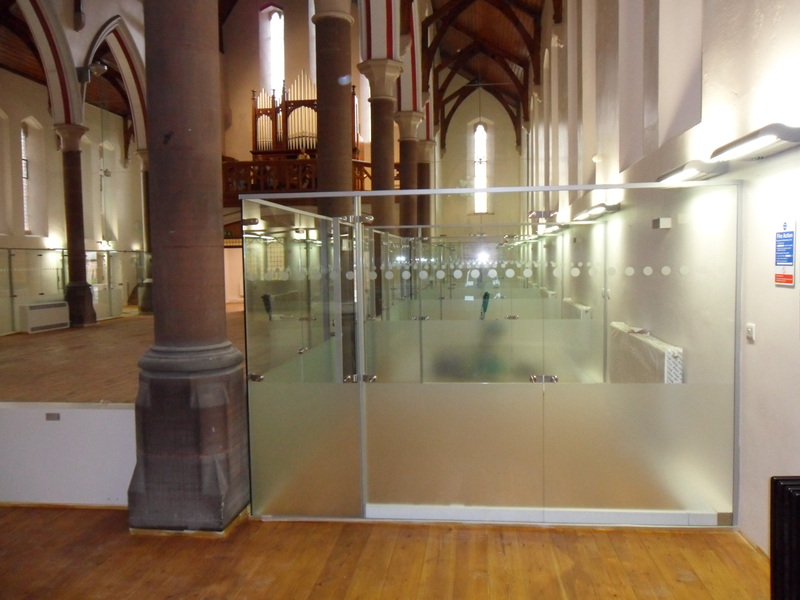 We chose glass so that the walls would be as sympathetic to the building and as subtle as possible. 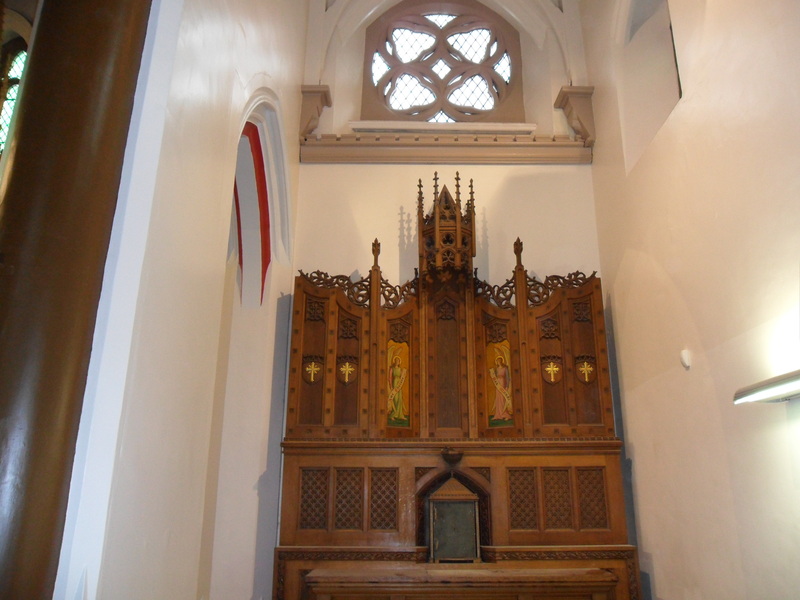 The covers are off from the Side Altar to the left of the Altar. 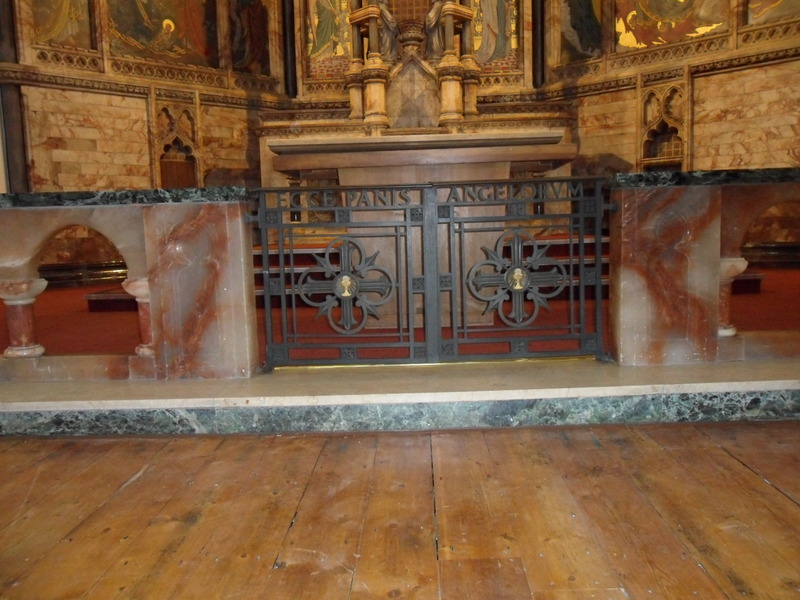 The covers have been taken off the Side Altar to the right of the Altar. More pics of the ongoing redevelopment of St Marie’s in Widnes, as captured by Dave Clark from John Turner Construction Ltd. 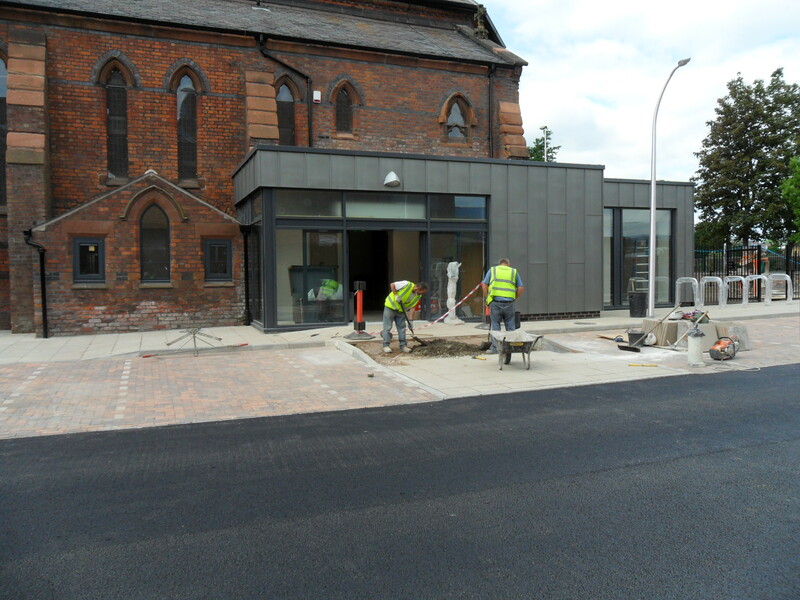 The photos were taken between Monday 9th June and Friday 13th June. A nice shot of the outside, now free from the graffiti which adorned it for a few days. The gents is a work in progress. 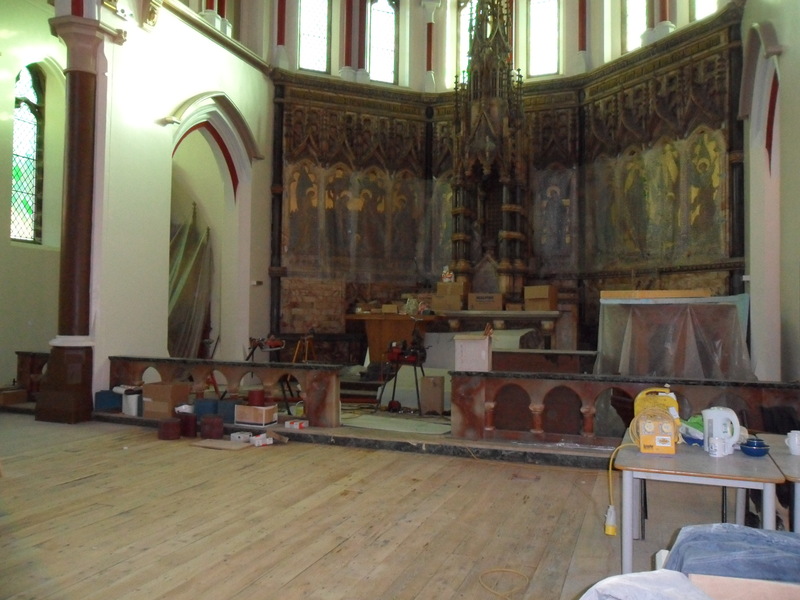 We created as much space as possible inside St Marie’s so that we could begin the treatment of the floor. 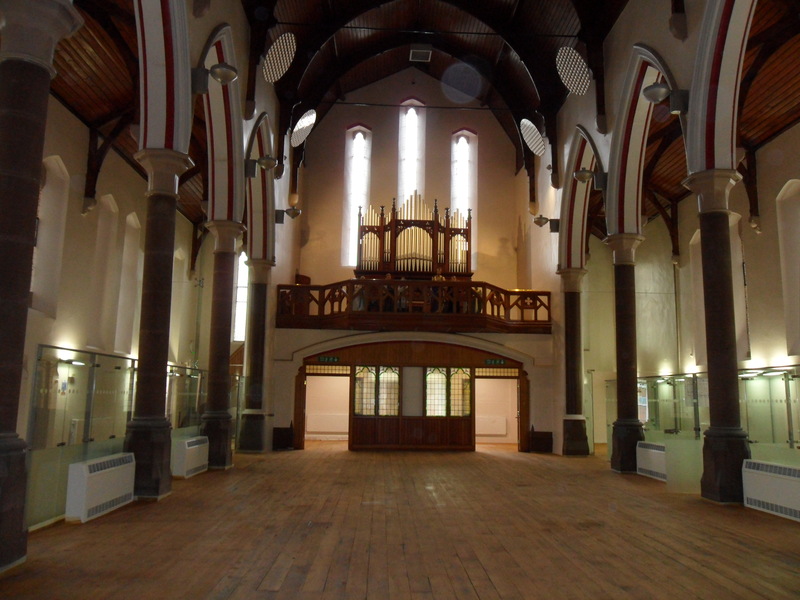 The altar paintings have been returned to the building. 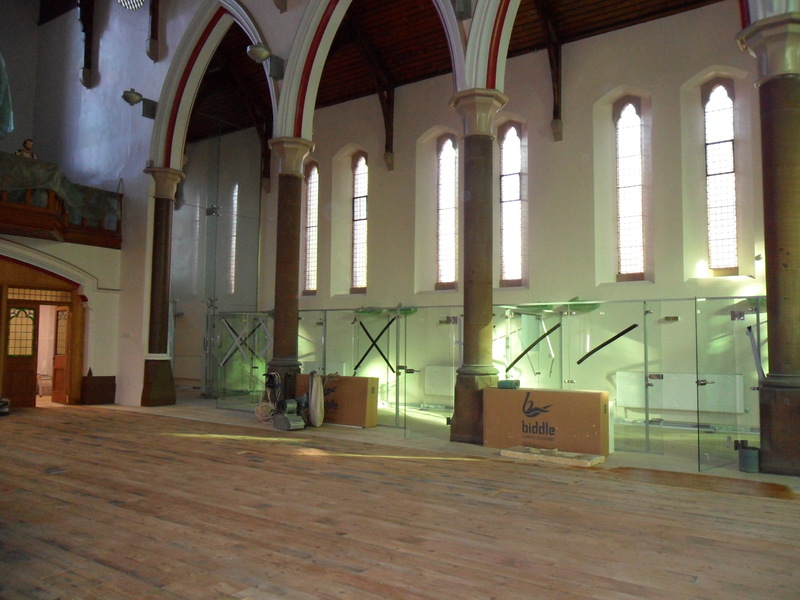 They will remain dust free and under bubble wrap until all the restoration work has been completed. Sincere apologies for the delay since I last posted. I’ve been without the internet for the past few weeks. As always, these photos were taken by Dave Clark (Project Manager and all round good egg) from John Turner Construction Ltd. The photos were taken between Monday 2nd June and Friday 6th June. A rail has been added to the wall on Lugsdale Road. Where the old floor meets the new. 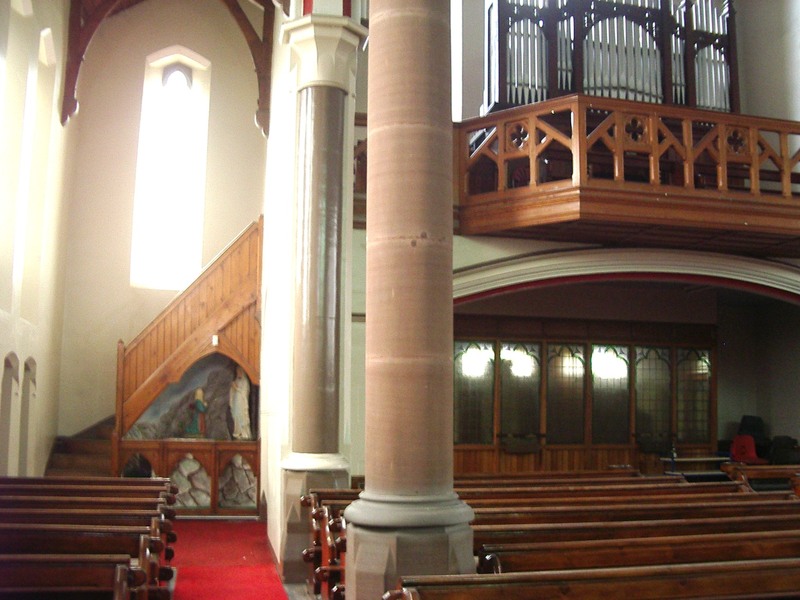 Here, the view from the Boardroom (under the Organ Loft). 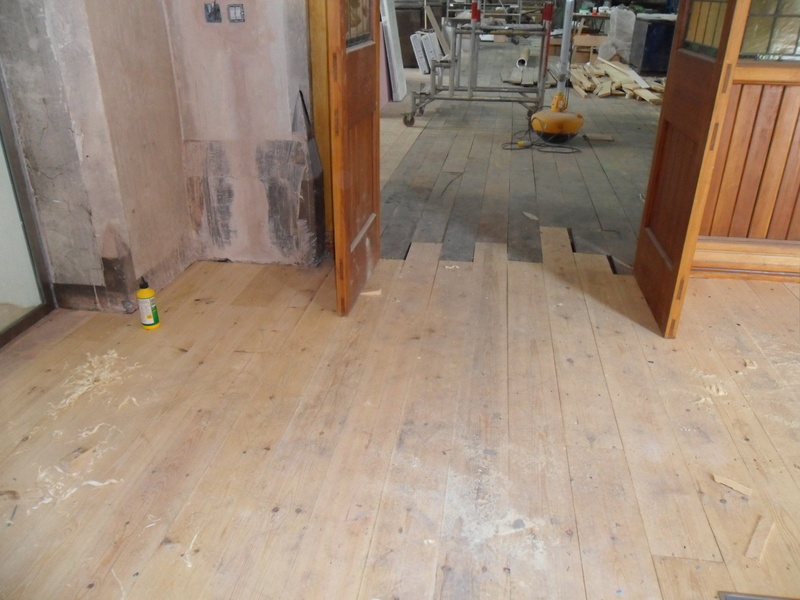 You can see the difference between the original floor (not damaged by dry rot) and the new. Both will be sanded down and varnished to make them as similar as possible. 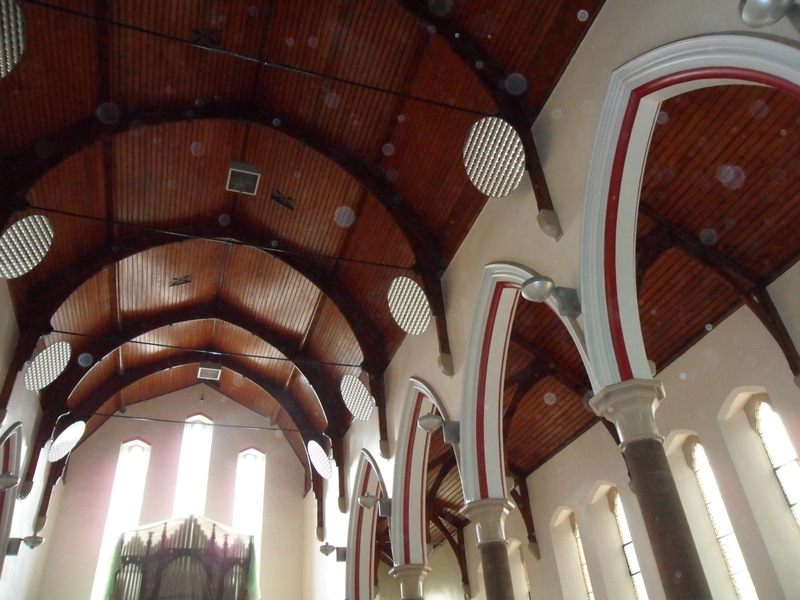 The reflectors in the roof, which reflect light both up into the ceiling and down into the centre of St Marie’s. 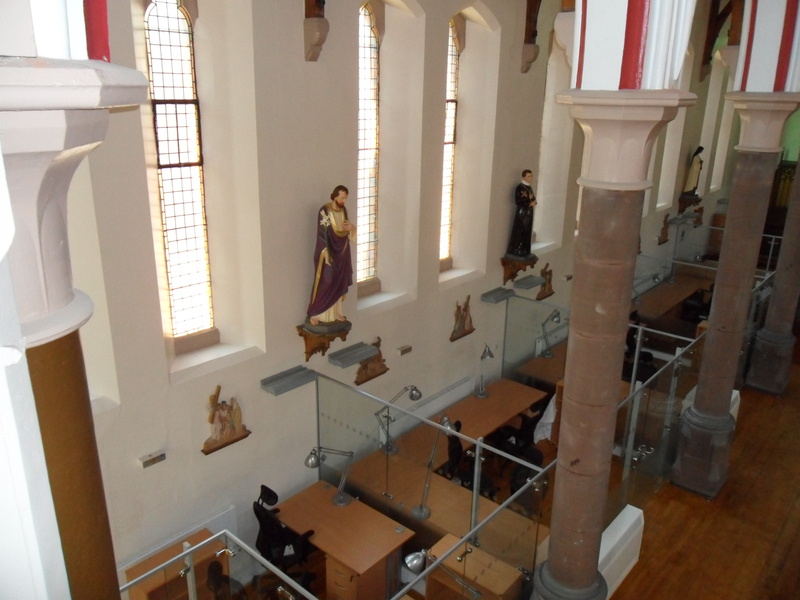 The view of the new offices from the altar. 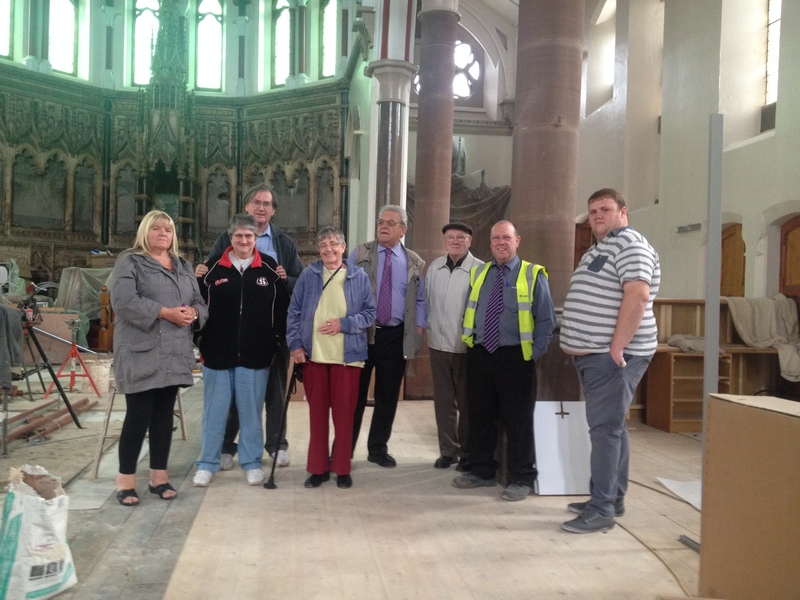 Sad to report that we’ll be unable to host any more Update Tours before the redevelopment work is completed and St Marie’s is once again open to the public. 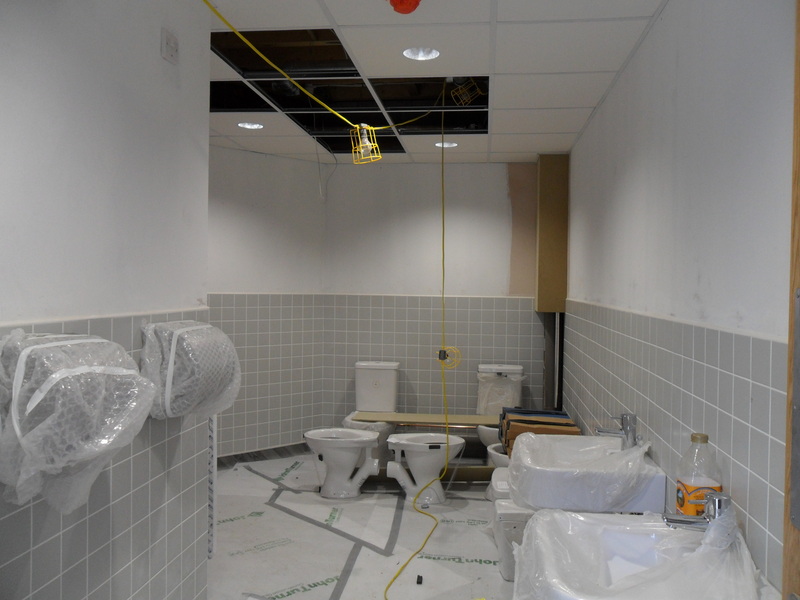 This is due to the nature of the work that will be undertaken on the floor over the upcoming weeks. 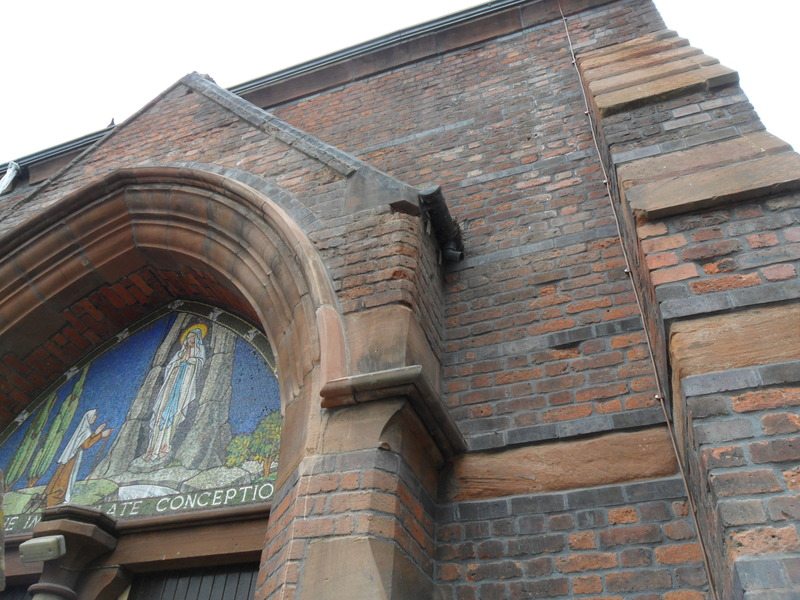 Not one of us could remember that the corner columns were painted brown (surely they were all just sandstone?) and we all wondered what was going on. However, this photo from April 2009 proves that even the best memory can still get things wrong! Thanks to everyone who asked if they could come along. Sincere apologies to those who we couldn’t fit in. 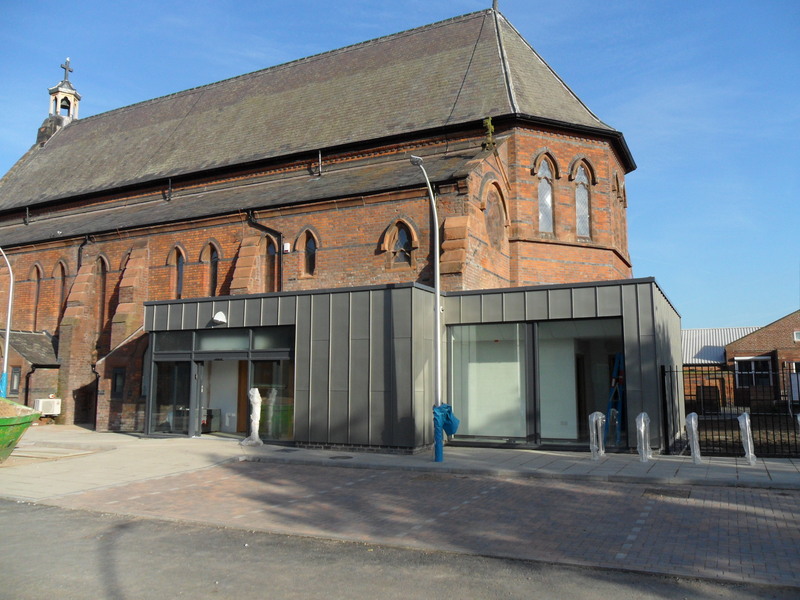 More photographs taken by the brilliant Dave Clark (John Turner Construction Ltd) of the (almost completed) redevelopment of St Marie’s in Widnes. The photos were taken between Monday 26th and Friday 30th May. 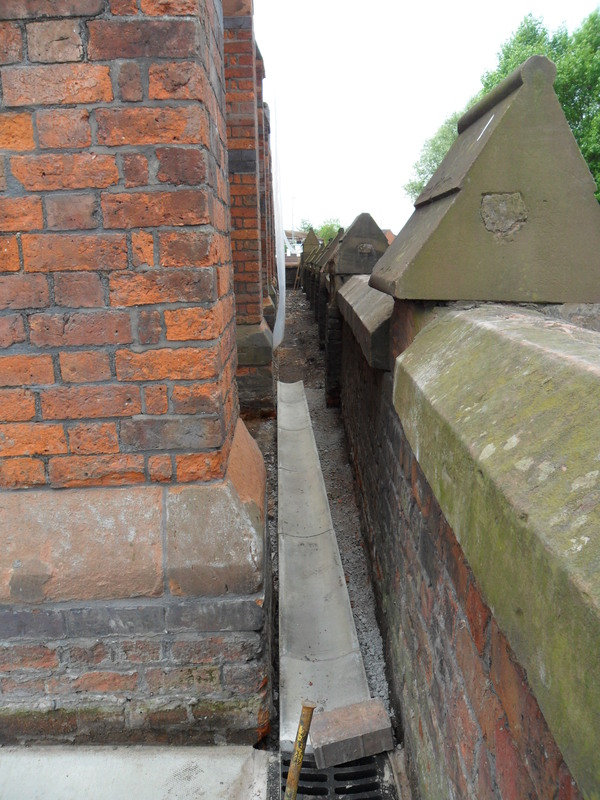 Note the curvature of the existing church wall. New drainage for the Lugsdale Road rain water pipes as the originals soak away. Was inadequate therefore the new drainage system will be accepting rain water. 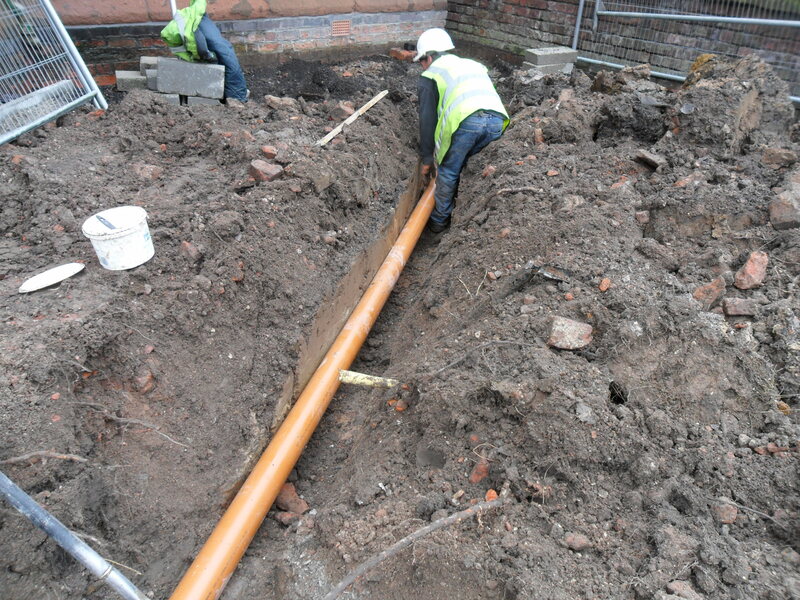 Installation of new drainage channel to accept rain water down pipes from the church roof.